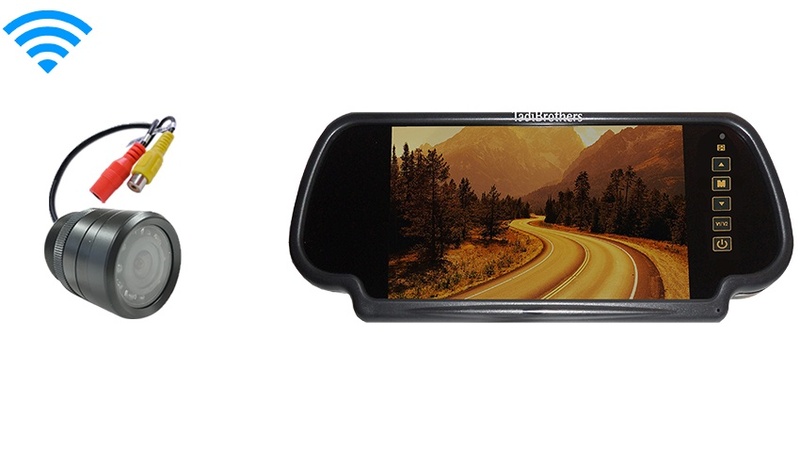 The crystal clear 7” LCD Mirror Monitor is a perfect addition to any driver that needs assistance backing up. See the whole world behind you in rich colors. The Mirror doubles as a regular mirror, when the camera is off, and a monitor (7” viewable) when the camera is on. Remember, even when the camera is on you can still use the parts of the mirror section that remain a mirror. In addition, it has two video inputs so you can connect a camera and a game system or DVD player. This mirror monitor is compatible with all our cameras and any car; it connects to any power source or a cigarette lighter. This mirror mounts by clamping on your current mirror and the clamps are adjustable so it will fit all cars. The Bumper camera is mounted by embedding it inside the bumper for a clean and secure look. The camera has a 120° angle which is best for Cars, SUVs, and Trucks. With 120° everything behind the vehicle can easily be seen, it is also color, waterproof and has military grade night vision. The camera is also durable for use in the roughest weather conditions. Different brackets are included for installation so it can be angled downwards or upwards if necessary for an ideal view.